Google+ isn’t all business, and it’s not just for geeky early adopters! It’s also for that time you need a break, or just need to cool down. For that reason, Google+ provides a cool section called Google+ Games that allows you to find, play, and challenge your friends to games that have been built for Google+. Google+ games are much more than that, though — they’re a great social way to challenge your abilities against the abilities of your friends, family, and coworkers and build relationships in the process. 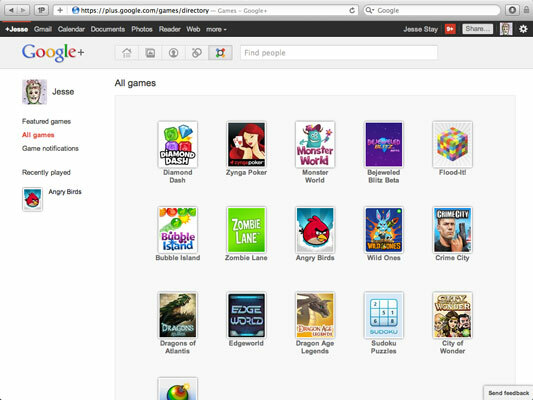 To get to Google+ Games, just click the Games icon at the top of your main Google+ page. The Featured Games page appears. On this page, you’ll see a list of featured games, followed by a stream of games your friends on Google+ are playing. Surf through the Featured Games. This is the most obvious choice. On the main page of Google+ Games, you’ll find graphics representing featured games that Google+ has carefully selected for you. Pick one that seems interesting. Google+ also shows you how many of your friends have played each of the games. Click All Games. If the featured games aren’t enough for you, go to the left column and click All Games. A list of all the games available appears. Just hover your mouse over the avatar of the game you are interested in and a blue Play button appears; click it to play that game. The All Games page on Google+ Games. Browse through your Games stream. 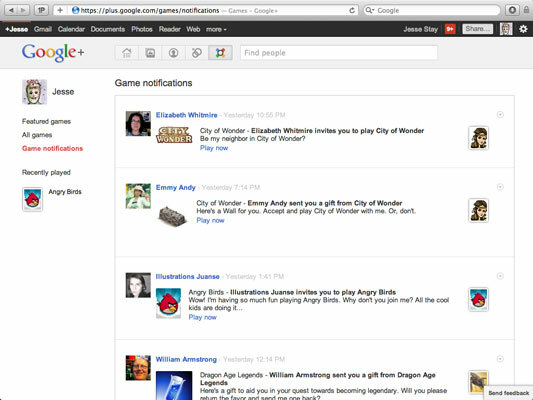 The main Google+ Games page shows a stream of all the games your friends are playing. Browse through this list to see what might be interesting. The most popular games are probably the ones that you and your friends will find most challenging. So, pick the games that your closest friends are playing for the best experience! Respond to Notifications. You can invite your friends and circles to play the games you’re playing. To see who has invited you to play a game, just click the Notifications link in the left column of Google+ Games, and a list will be presented of those who have asked you to play with them. The people who have invited you to play with them are people who really want to get you to try out the game with them or try out something new. Each game you play can be a team-building exercise! Find games that your colleagues or family members or other types of team members may be enthusiastic about. Find ways to induce a competitive spirit among those you play with.